The reveal of the Scrylands in Theros have been responsible for more belly-aching and nonsensical complaints (“these cards have no value! Putting them at rare is a cash grab!”) than any other Magic card in recent memory. The existence of the gates at common in Ravnica block hasn’t helped by providing a strong contrast to what some perceive as a marginally better land. My goal today is to develop an accurate concept of their power, use that concept to prove that a bunch of people are stupid, and then finally discuss common trajectories of rare land cycles in Fall sets. Let’s start with scenario A, where you keep a 7 card hand with 2 lands and Serum Visions. You put a Hallowed Fountain into play and tap it to cast Serum Visions. You immediately draw a card, and then scry 2. You end up with 6 cards in hand, 1 land in play tapped, 18 life, and fixed the top 2 of your library. In scenario B, you have a 7 card hand where 1 of those lands is the UW Scryland. You put it into play tapped, and scry 1. You keep the card or you ship it to the bottom. You end up with 6 cards in hand, 1 land in play tapped, and you fixed the top card of your library. 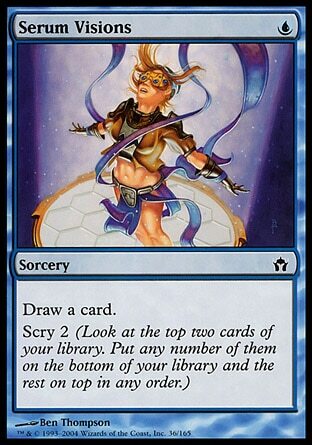 In scenario A, Serum Visions is similar to Gitaxian Probe in a way – you’re going to replace it with the top card of your deck, but you don’t actually know what that card is. Is it removal? A threat? More mana? We don’t have that knowledge yet. So more accurately, you have 6 cards that are known, and a 7th that is a mystery card. This is in contrast to scenario B, in which you have complete knowledge of what your 7 available cards are. This has a not-insignificant impact on your ability to make mulligan decisions. For example, what about an opening 7 card hand with 3 Serum Visions? You really only know 4 cards at that point. In scenario B, you know exactly what your hand looks like. If you have 4 Scrylands, you know for sure you’re hitting your first 4 land drops. Along the way, you’re going to be monitoring your top card in an attempt to not draw something you don’t want. Another way to consider the side effect of impreciseness of information is to consider a 1 land hand. A 1 land hand with Serum Visions is far riskier than a 1 Scryland hand. A 1 Scryland hand is pretty easily a mulligan. A 1-lander with Serum may entice you to keep, and if you don’t have a land in the top 4 cards, you’re in real trouble. Returning to our original scenarios, which fares better, the Serum or the Scryland? There’s definitely value in scrying an extra card deeper, especially so for a combo deck that just wants to get as deep as possible for particular pieces. However, the more accurate information of the Scryland certainly has value. There are plenty of 1-land Serum Visions hands people have kept and promptly lost because they expected it to do too much work. Overall, I’d say that in your opening hand, a Serum Visions is reasonably better than a Scryland if piloting a combo deck. In a control deck, the margin between them is considerably thinner. How about late in the game? Say it is turn 9+, and both you and your opponent are now topdecking. In scenario X, you draw your Serum Visions. You pay 1 mana to immediately draw the next card, and you then scry 2, hoping to move lands and irrelevant spells to the bottom of your library. You effectively drew 1 card (the Serum doesn’t really count, since you immediately replace it,) tapped 1 mana, and you scryed 2. In scenario Y, you draw a Scryland. You put the land into play tapped, and either keep or ship the top card of your library. You end up with 1 additional mana which is tapped, and you scryed 1. Scenario X sounds a lot better, but wait a moment. What if the card you drew off the Serum Visions was a land? You put it into play, and now you’re in a very similar situation to the Scryland play – 1 tapped land, an additional one in play, and now new cards in hand. You did scry one extra card deeper, though. This is objectively better, but that doesn’t mean it is better in every situation. Imagine your opponent has no threats on board and your scry sees a land on top and the new Murderbore second from the top. You ship both because you don’t need either; at this point you want a threat. Then your opponent rips a creature, and you find yourself wishing you still had that Murderbore. If you had only scryed 1, you would have shipped the land, and then drew the Murderbore at exactly the right time. This isn’t to say that scrying for 1 is better than 2, but simply that occasionally you will burn yourself by having to make decisions about the game state several turns down the road with very imperfect information. So far, it sounds like Serum Visions is basically better than the Scryland in both the early game and the late game. However, that isn’t taking into account a very important factor – the Scrylands don’t cost you a card. When you put 4 Serum Visions into your deck, you’re down to 56 cards left. The Scrylands, however, are slotted in as lands. If history has taught us anything, it’s that lands with added value are incredibly potent. What other lands have functioned as spells? Kessig Wolf Run, Moorland Haunt, and the rest of their Innistrad Ilk have this feature. The manlands from Worldwake, which saw heavy Standard play and continue to see moderate Modern play, are also lands that grant additional value. Most recently, Mutavalt in M14 fills this role. Historically, most lands that have any sort of additional spell function make a good run in Standard. While Serum Visions is often better than a Scryland, it is a spell and a spell alone. It provides velocity and mild card selection, but costs you information in your opening hand, card slots, and mana. In contrast, the Scrylands are about 1/4th to 3/4th as good as a Serum Visions depending on the situation, but are stapled onto lands so their effect is essentially free. Take a gander at Eyes of the Watcher, which gives us a foundation that scry 2 is worth roughly 1 mana. From this, it is fair to say scry 1 is worth roughly half a mana. The cost to playing these lands is the tempo loss of being forced to play it tapped, which all but the most dedicated aggro decks can often afford. This means that every time you put a Scryland into play, you’re getting roughly half a mana’s worth of value for roughly free. How many other lands can claim this? There are a lot of nuances to understanding exactly how good the Scrylands will be in various decks and various situations, and Pat Chapin will probably provide better insight than I, but I hope this general discussion will illustrate that the Scrylands are considerably stronger than many out there would have you believe. Now that we’ve established that they’re not just a “blatant cash grab” we want to consider their financial trajectory. What can we expect out of them early on, and what does their price life look like a year from now? There are a lot of examples to look back on to answer these questions, the most recent just a quick hop back in time to Innistrad, and before that, Scars of Mirrodin. 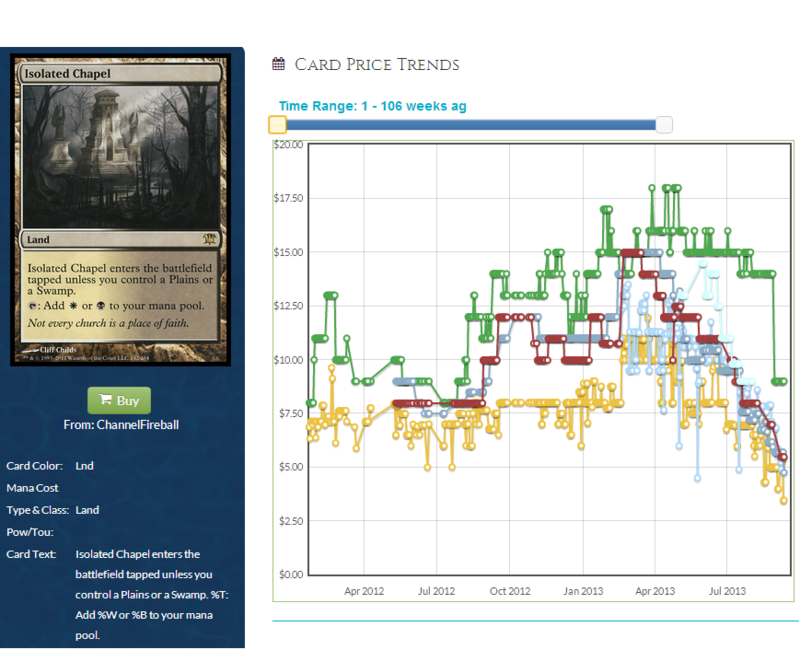 Both the Innistrad Enemy Checklands and the Scars of Mirrodin Fastlands had considerably similar price histories. During prerelease, they preorder for somewhere between $4 and $10. As the set becomes drafted and copies begin flooding into the market, prices start dropping. They see some amount of play, but because they’re available in such quantity, and the previous set land prices have risen, they remain suppressed in value. Isolated Chapel and friends were all well under $4, some even dipping below $2 at times. The SOM Fastlands did the exact same thing; I clearly recall seeing Seachrome Coasts being under $2 at one point. The lands hit their floor typically in early spring. 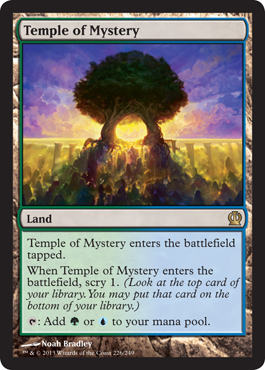 As we approach Summer, players begin to dump their rotating lands from the prior set, and the Magic market as a whole collectively realizes that the only lands they’ll have available to them in September will be the [Fastlands/Checkands/Scrylands.] Prices begin to tick up slowly over the summer, and once fall hits, the lands take turns spiking hard as decks of the appropriate colors show up with a full playset. Isolated Chapel was nearly $20 at one point, as were Seachrome Coast and Darkslick Shores. Finally, after enjoying their time in the sun (which is actually autumn and winter), the following spring rolls around, and the circle of life continues. They too follow the footsteps of the prior set’s lands, just as those did one year earlier. 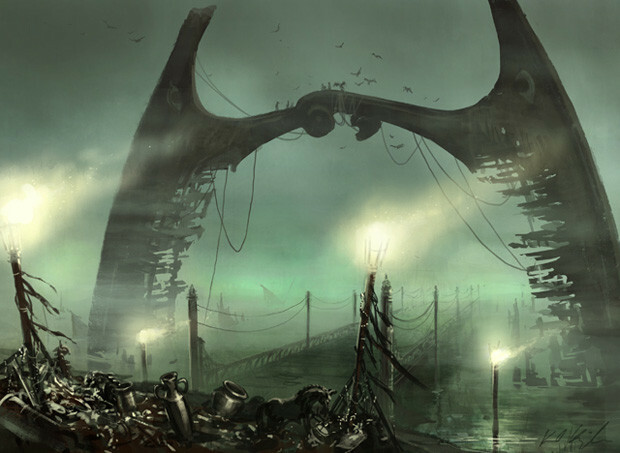 Looking backwards, the Shocklands have followed this exact trajectory to date, and are poised to break out in short order. Before them, the Checklands, the Fastlands, and the Zendikar fetches have behaved accordingly. There is no reason to expect the Scrylands to deviate from this pattern. They’re preording for $5-$9 at the moment, but they’ll be sub-$3 soon enough. I’ll personally be vacuuming them up as soon as they dip that low, and if I see any hit $1.50 on a retail site, there’s a chance I’ll go deep – several hundred dollars deep. On a completely unrelated and final topic, I’m disappointed that the B&R list didn’t have any changes to a non-pauper format. The formats may be reasonably stable, but there is no reason they couldn’t have shaken things up with some low-impact unbans in Legacy. It leads me to believe that they simply weren’t thinking about it rather than they closely examined their options and chose to do nothing. See you next week when I do a (mostly) full review of Theros. Previous PostThe Significance of Aggro in a New StandardNext PostAre You a Collector? It seems a bit asinine to open your article with the goal of ‘proving others’ stupidity’. You anchored to Serum Vision as the main comparison/argument as to why these are good, but provided no statistical backings to illustrate your claims of such. You mention a concern of burying utility cards with Serum Visions, which could provide useful during unforeseen changes in gamestate – this is a suboptimal argument at best. Visions, which not every deck wants to run, is superior to these lands in that drawing an extra card thins your deck ; and in that scry 2 is 200% better than scry 1. If you toss away a card, two turns ago – that would be helpful now – how can you blame yourself? You can’t. Certain aspects of this game are unpredictable, and that in no way makes these lands mo’ betta’ or serves to enhance the desire or price-tag of these cards. As a collector, player, and long time finance aficionado – I find these lands to be nothing but a half-witted attempt by R&D to saturate the secondary market with cards incapable of living up to the retail value they will unfortunately command. I have to agree with Zach. I was one of those people who feel the Scrylands are in the wrong rarity, or don’t scry enough for it’s rarity. And then to use Serum Visions as a backing on why you feel they will be in the same value as shocklands is a bit shallow. Zack: To your first point, I have no qualms pointing out when others are expressing opinions that are based on flawed logic or factually incorrect information. I’m not setting out to attack individuals, but I think dragging incorrect assertions into clear discussion and showing why they’re incorrect is helpful for all parties involved. You seem to have anchored onto an example, but ignored the body of the article: The lands compare reasonably favorably to Serum Visions. I used several examples of various scenarios to illustrate how the difference between playing the land and Serum Visions is somewhat similar. I made no attempt to show through statistical means or other empirical methods that they are X% as good in Y% of situations. The entirety of purpose of the first half of the post was to provide a framework with which to help us understand how the lands compare to previous, known quantities. As a “collector, player, and long term finance aficionado” I’m curious why you would be so unhappy with these lands relative to others. The Innistrad Checklands are irrelevant outside of standard, boring, and had no unique or engaging facet. The Fastlands were similarly uninspiring, although at least useful elsewhere. A majority of rare lands in Magic’s history are there to serve a temporary need, not to fulfill a long-term role. There are only a handful of sets of rare lands that maintain relevancy to any particular group of players for years down the road, and occasional 1-ofs from various cycles. I’m not sure what about these lands or Wizard’s goals for them could be construed as “half-witted.” The Scrylands are in fact rather unique for a dual land, in that they provide an effect beyond simple efficient fixing. They certainly have a chance to remain more useful in other formats than the Innistrad Checklands do, in any case. While they may not ‘grok’ as inherently powerful, I firmly believe that the next year will show that they have a far more drastic impact on games than seems to be common perception. In summary, it sounds like you’re upset I told you the lands are good, and that you have no real reason for disliking them. Dan: Scry 2 would be absurd on these cards. There is absolutely no way they could have increased the scry value without making them obscene. If you don’t like comparing them to Serum Visions, what would you have me use as an example? I tried to pick a staple with a known power level. These cards will see heavy play in upcoming standard, that being said, your assessment of them misses the mark a bit I feel. Scry 1 is not Scry 2, and these are not anywhere near the power level of Serum Visions or Magma Jet for this reason. Both of those cards are extremely powerful because you get the filtering effect of looking at 2 cards + the 1 for 1 aspect of drawing a card or killing a creature. When you look at just 1 card, it’s either good, in which case you were gonna draw it anyway, or it’s not and you’re at the mercy of a random topdeck again. Combined with the coming into play tapped aspect not actually giving you your card back on the turn you play it, makes these just Guildgates with a very small amount of upside. The guildgates were gonna see play in new standard anyway, so of course these will have to see play just due to the lack of mana fixing for 2 and 3 color decks. But their power level is very low, about equivalent to an Uncommon, worse than any rare dual land cycle we’ve seen in many years. Yes b/r guildgates saw play in zombies, but I don’t remember anyone actually liking it. As a side note, I think we’ll be seeing a lot more keyrune usage coming up. I believe you are undervaluing the scry here. It is not a “very small amount of upside” compared to a gate. If you leave the card on top, yes, you would have drawn it anyways. But now you know whatever it is that you needed (counter, removal, creature, another land drop) is coming, and you can play accordingly. It may not put the card into your hand immediately, but it gives you that information so that you can make proper plays until your next draw. If you were going to draw something you didn’t want (an extra land late in the game) and you get to move it to the bottom, you can’t ask for much better. You may not be guaranteeing you draw a helpful card, but at least you’ve guaranteed you don’t draw that useless card. Basically, the first extra scryland you draw helps make sure you don’t draw a second. I’m not claiming that scry 1 is unbelievably powerful. What I’m trying to express here is that scry 1 is stronger than many give it credit for, especially when you’re basically getting it for free. Think about it this way: if at any point in Magic you had the option to play your land (any land) tapped and scry 1, you would find yourself doing it very frequently. The scrylands obviously don’t give you the choice, so they’re not quite as powerful, but the ability is still going to do a lot of incremental work over the course of a game. I’m not sure why people are so upset over these. Both sets of Checklands were completely without any emotional thrill. Nobody got excited about any Checklands. In a format without Shocks, I’m not even sure the Checks are better than the Scrylands. During SOM/INN people played them, but only because it was the only fixing available past the Fastlands. The Scrylands give you solid value when they come into play at the cost of being tapped, while the Checks come into play tapped somewhat frequently (I would guess 20-30% of the time in a 2-color deck) without giving you anything, and don’t help at all late game. Every rare land in the Modern border capable of producing two colors has situations in which it enters the battlefield tapped or can’t produce colored mana (excepting Grove of the Burnwillows.) The Scrylands always enter tapped, but they always produce both colors, and you get paid simply for putting it into play. The Scrylands may be visually underwhelming, but they are not underpowered. all of your comparisons are to lands which come into play untapped or at least have the option to come into play untapped if/when you need them to. guildgates are horrible, these are just more guildgates. you are still overvaluing scry 1 to the point of craziness. if you put the card on the bottom you are still at the mercy of the top of your deck, your odds of drawing the card you don’t want be it land or spell don’t increase much at all. and knowing the top of your deck rarely comes into play at all. what does come into play is timewalking yourself with tap lands because you can’t play your 3 drop on turn 3, 4 on 4, etc. have you actually played with them? we’re testing for the pt and find the lands to be just as bad as guildgates with no real upside outside of the occasional domri activation hitting a creature because you put a land on the bottom (still just as much chance it will still be a land). Didn’t Wizards say that Theros would feature a rare land-cycle that players have been looking and awaiting for some time? I think that led to wild (and perhaps unattainable) speculation that these lands failed to deliver on. They did, and I completely agree. I thought there was a solid shot of enemy-colored manlands coming, and I also picked up a foil set of Nimbus Maze after popular opinion swung that way. Wizards did a great job of setting the stage to make everyone disappointed with these, regardless of how good they actually turn out to be. Agreed that people may be undervaluing the Scry ability on these, but I don’t think it’s unreasonable to presuppose that (from at least a financial perspective) these will be the least worthy mana-fixing lands that have been made in some time. I like your article because even if I disagree and think you’re overvaluing the scry 1, now we have a foundation to compare against. Your first problem is calling the scry 1 basically free. A land coming into play tapped is a huge cost, not a small one, although the tempo-cost is very dependent on where the game is in development. Early game, it’s a virtual time walk for the opponent, mid-game, it’s a minor tempo disadvantage where you probably wouldn’t mind spending 1 mana to scry one (although it’s obviously less of a cost if you can choose to or to not pay), and late game it’s the best possible land draw. However, in each of these phases, the cost is at least one hybrid mana, but higher because spending mana is a choice, and you obviously don’t have the option to not “spend” it by having your land CipT. You said that eyes of the watcher proves scry 1 is worth half a mana. And that’s the second place I take issue with your analysis. At its baseline in your argument, the “mana” cost of the ability is higher than its value, albeit a different cost because you were explaining it in the context of being on a spell; whereas on a land it doesn’t eat a spell slot, which like you said, significantly decreases the cost. In the end, I’m sure these lands are better than the terrible many (myself included) complained they are. But they are pretty frustratingly bad for modern era fixing.